You might be thinking, why does this effect me? No, it’s not because quarterback Peyton Manning will be attending as a keynote. It’s because HIMSS16 revolves around leveraging IT to better healthcare. Everyone has experienced a bump in the road or negative experience when it comes to healthcare. We are all looking for that next big thing to improve these issues. Having a week of keynotes, panels, meet-ups, showcases, etc. that are dedicated to healthcare innovation, is the perfect place to start conversations about these problems and brainstorm how to go about solving them. 1.) How can we leverage IT to better healthcare? This is the overarching question of the whole conference. Whether you are an attendee that is a physician, data scientist, or representing a vendor, you are attending to better healthcare in some way. Our team is always looking to use data in different ways to assist in healthcare decisions. We are optimistic that more data will become open and available to consume.2.) What advances and platforms are entering the EHR market to ease concerns about usability and interoperability? Recently, EHR usability and interoperability have been a main concern of healthcare providers and hospitals. Many are looking to see how vendors are making improvements and adding features to their systems. When developing these new features, they want to make sure clinicians are involved in the process from the start. The more we integrate relevant data into systems such as EHRs, the better the decisions that will be made. You can learn more about the power of EHR data and optimizing care delivery, by attending this session. 3.) What new products are going to be launched this year? This week is key for any product or organization launch. For instance, VisualDx will be debuting a new version of their clinical support system. It will include a more detailed way to diagnose through imaging. Take a closer look at a handful of new products being launched at HIMSS here. 4.) In what way can we better involve a patient’s voice and increase engagement? Thomas Goetz will be speaking about how “The Future of Healthcare is Personal”. This talk will draw attendees to begin thinking about ways to improve a patient’s experience. With better experience, the more likely it will be to obtain more robust and accurate data. The data available can then be better analyzed for trends and to predict outcomes. 5.) How do companies utilize big data sets and minimize the noise of useless information? “Big Data” can be a huge asset for any organization. It won’t be of any help to you or to consumers if there is no strategy involved with extracting and analyzing the data. It is important to partner with the right people or make sure your team has a clear vision for what they want to get out of a data set. If you are most interested in big data initiatives, check out the 5 must see sessions here. Even if you are not able to attend the conference, there are plenty of ways to engage. Be sure to follow and stay on top of HIMSS16 hashtags, blogs, and live updates. 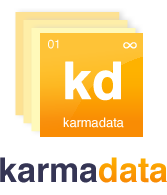 For more information regarding karmadata, please reach out to contact@karmadata.com or sign up for a webinar here.